Swedish dockworkers in the port of Gothenburg are in the midst of a long-running dispute with APM Terminals (APMT). This dispute between members of the Swedish Dockworkers’ Union (SDU) and APMT has seen the union’s right to represent its own members targeted and Swedish labor laws ignored by the company. APMT is now threatening to lay off as many as one hundred dockworkers. The photo was taken during the one-day strike on January 24. According to Swedish Dockworkers’ Union (SDU) activist Erik Helgeson, this dispute is “about fundamental trade union rights”. “It is really about basic questions. We are not making any aggressive demands, but are only defending our rights and our jobs” he told the Internationalen newspaper*. This long-running dispute began back in 2015, when new local management arrived at APMT Gothenburg. These new managers quickly displayed their belligerence towards dockworkers by ignoring long-established Swedish workplace laws around collective bargaining and health and safety rights and repeatedly trying to deny SDU members the right of representation from their elected representatives. Their belligerence has now escalated to threats of mass redundancies. To date, SDU members have since April 2016 taken part in several one-day strikes, shorter intermittent strikes and implemented various work bans which have stretched for months at a time. The latest action was an eight-hour which took place on January 24. Further strikes planned for late February were called off in order to pursue negotiations. The stakes in this dispute are high. The port of Gothenburg is the largest in Scandinavia and handles around half of Sweden’s total container traffic. APMT, which won the Gothenburg terminal concession in early 2012, is the world’s third largest container terminal operator and part of the Danish-based Maersk conglomerate, the world’s largest operator of container ships. The port of Gothenburg is also a traditional stronghold of the Swedish Dockworkers’ Union (Svenska Hamnarbetarförbundet or simply Hamn in Swedish), the union which represents the majority of dockworkers across Sweden and covers around 85% of all dockworkers in Gothenburg. At the heart of this dispute is the new APMT management’s belligerence towards the SDU. Since 2015, new local managers have set out to continually undermine dockworkers’ rights to SDU union representation. They have tried to dictate how many and which specific union representatives would be allowed to participate in negotiations and have tried to stop elected SDU officials from updating union members about the ongoing dispute. Swedish labor laws, collective bargaining agreements and health and safety regulations have also been brazenly disregarded. Dockers who have worked extra shifts have not been compensated for them. A sick and aging docker has been used as a bargaining chip to try and extract “no strike” clauses and other concessions in exchange for the retraining for lighter duties which this docker should have already received. Attempts to have non-docker staff carry out tasks traditionally done by dockworkers have been made. Elected health and safety representatives have been excluded from workplace risk assessments and accident enquiries. Annual leave and parental leave legislation have also been violated with either the late notification or unlawful denial of leave for dockworkers. SDU members refuse to be intimidated. The first round of industrial action began with four 24-hour strikes spread across April and May 2016. November 8 saw the beginning of a ban on overtime, new hiring and recruitment. 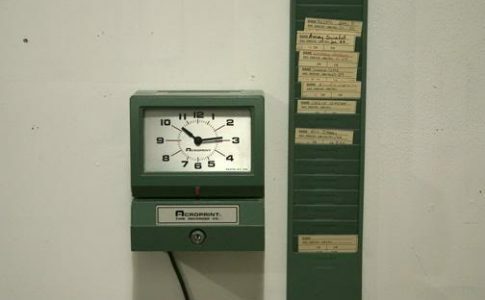 Intermittent strikes between November 15 and 18 that ran for 28 hours also took place. In an attempt to break the deadlock, SDU Local 4 (Gothenburg) held a membership meeting on December 15 where two proposals drawn up in consultation with SDU and IDC leaders were put forward. 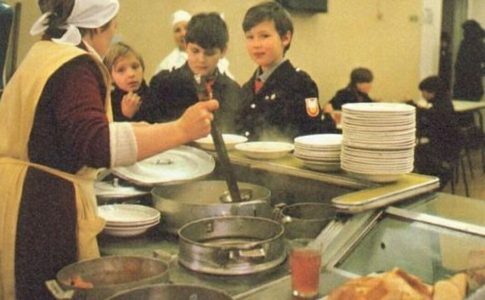 The first was to offer APMT a three month period with no industrial action in order to do two things. One, negotiate for the adoption of a new production model based on other European ports which would aim to increase flexibility and productivity without raising overall labor costs. Two, set a framework for solving the outstanding issues of health and safety problems, poor workplace relations and other problems. The second proposal was for a plan of continued industrial action which would include an extension of the current overtime ban, new strikes and a call from the IDC for global solidarity action. The SDU Local 4 membership meeting voted unanimously to support both proposals, which were presented to APMT on December 16. Local management promised to formally respond within a week. While dockworkers were waiting for a response, management announced a new program of job cuts. These plans include proposed reductions in the size of crane gangs from nine to eight people (smaller than other European APM terminals) and changes to work hours. These ‘efficiency measures’ would lead to redundancies for an estimated 60 dockworkers, including all those on temporary contracts along with 24 permanently employed dockers. APMT have since increased this figure to 40 permanently employed dockers and all temporary employees, pushing the total closer to 100 redundancies which is almost one third of the whole workforce. On December 23, SDU Local 4 representatives met with APMT and received the company’s formal response to the SDU’s proposals, a one-page document which did nothing but repeat the company’s previously held positions. Management then ended the meeting by telling SDU representatives that it will not allow the union to participate in upcoming redundancy negotiations, even though almost every single docker threatened with redundancy is an SDU member. SDU Local 4 members responded to management’s end of year provocation by launching a fresh ban on new recruitment and overtime and then struck for eight hours on January 24. Further action was also planned for late February. Two four-hour strikes on February 21, an eight-hour strike on February 23 and one-hour sympathy strikes at midday in other ports on the same day were to occur. 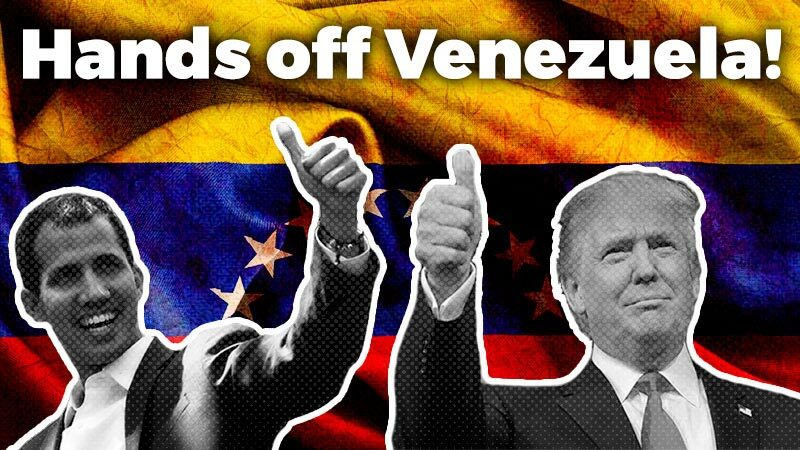 However, these were called off on February 17 after APMT CEO Henrik Kristensen agreed to meet with SDU and IDC leaders on February 23. The members of the SDU have a rocky road ahead of them. Along with the belligerence of the new APMT management team, there are two other hurdles in their way. The first is the fact that the SDU has never been a party to a collective bargaining agreement under Swedish law. The second is the role of the Swedish Transport Workers’ Union (STWU), the other union that represents some of the country’s dockworkers. 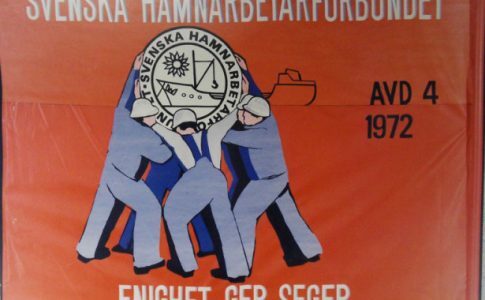 Since it was formed in 1972, the SDU has never had a collective bargaining agreement with the Ports of Sweden employer group or any stevedoring companies. This is partly due to Sweden’s highly centralized industrial relations system which favors the older general transport union, the Swedish Transport Workers’ Union (STWU – known in Sweden as the Svenska Transportarbetareförbundet or simply Transport). Under this system, the STWU has the status of a stakeholder in the collective bargaining process, while the SDU does not. So even though the SDU covers the majority of Swedish dockworkers, it is the STWU that handles collective agreement negotiations. (Despite this, the militant actions of the SDU have repeatedly forced the STWU to renegotiate agreements in the interests of all Swedish dockworkers). Both employers and STWU leaders have continually opposed the SDU becoming a party to collective agreements. Employers prefer to deal with the bureaucratic STWU, which has a history of regularly signing agreements with little or no membership consultation. And the STWU wants to keep its younger, more militant competitor out in the cold. The SDU’s lack of stakeholder status explains the one counter-proposal that APMT Gothenburg have put forward – that the SDU sign side letters to the company’s existing collective agreement with the STWU. Management claims that this would “automatically” resolve many of the outstanding issues in Gothenburg. This is rubbish, of course, as the company’s actions affect all employees regardless of union affiliation. The SDU continues to reject any need to sign side letters, as to do so would give the SDU all the responsibilities and restrictions of a stakeholder, but only some of the rights. For instance, the company could make an agreement with the minority union (STWU) to implement change and simply ignore the “side letter” union (SDU) if it disapproved of the changes. Any such agreement signed by the employer and the STWU but rejected by the SDU would still be binding on both STWU and SDU members. Signing these side letters would also see the SDU sign away its right to strike for little real benefit and force it to play a subordinate role to the stakeholder union, the STWU. APMT Gothenburg is well aware of the SDU’s long-held opposition to signing side letters. Its proposal for the SDU to sign them is simply a convenient excuse for avoiding genuine negotiations. The SDU has continually fought to become a stakeholder in the national agreement and has consistently proposed a solution where the union co-signs contracts with the Ports of Sweden employers’ association and the STWU. This is a solution that both the employers and the STWU continue to reject. Relations between the SDU and the STWU have been extremely bitter at times. This rivalry began with the formation of the SDU in 1972 by over 1000 rebellious dockworkers who had been expelled from the STWU. The SDU’s membership of the International Dockworkers Council (IDC) and the STWU’s affiliation to the International Transport Workers’ Federation (ITF) also complicates matters. [For more on this see: Swedish Dockworkers’ Union: Born fighting bosses and bureaucrats]. 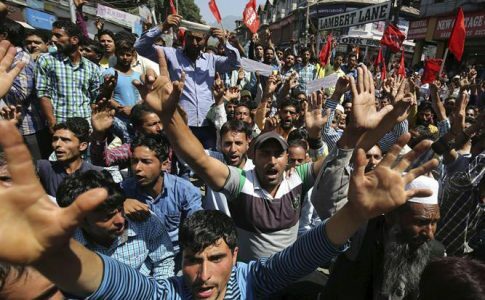 APMT has sought to play on this rivalry by falsely suggesting that this current dispute stems from union in-fighting, despite the fact that local representatives from both unions have negotiated together and presented a united front. STWU President Lars Lindgren issued a statement on November 8, 2016 which has undermined this unity. Described as “a new low” by the SDU, the statement says that “APMT Gothenburg follows Swedish law and follows the rules in relation to its legal counterpart which is the STWU. The APMT Gothenburg is neither better nor worse than other port operators in Sweden.” The fact that local management has repeatedly breached annual and parental leave legislation and APMT is notorious across Europe for its aggressive anti-union policies appear to be of no consequence to Lindgren. Another STWU statement issued days later opposed the further participation of elected SDU representatives in health and safety issues at APMT. Both statements have since been deleted from the STWU’s website. For more on this, see the SDU article “[A new low: The Swedish Transport Workers’ Union shifts position on the APMT Gothenburg Dispute”]. Lindgren’s November 8 statement played into the hands of local APMT management so well that copies of it were attached to a company statement sent to APMT customers. On the flipside, STWU members have been so incensed by this statement that some have abused their local officials over the phone while others have resigned in disgust and joined the SDU. and for flyers in English, French, Spanish and Portuguese]. 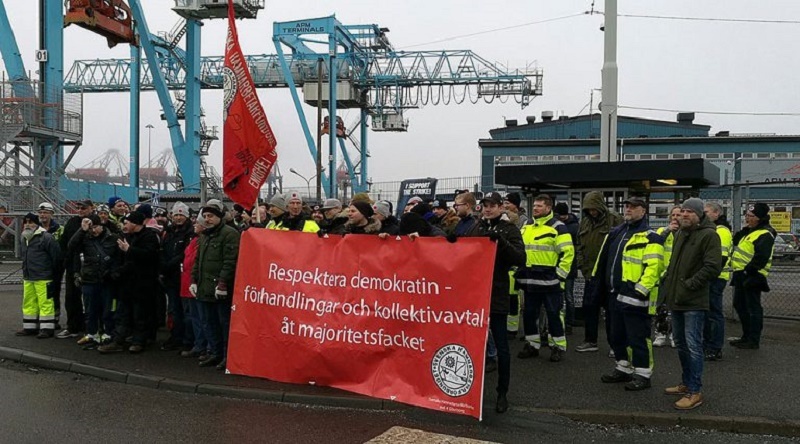 The members of the Swedish Dockworkers’ Union need our international solidarity in their fight against APMT Gothenburg’s planned job cuts and anti-union agenda. 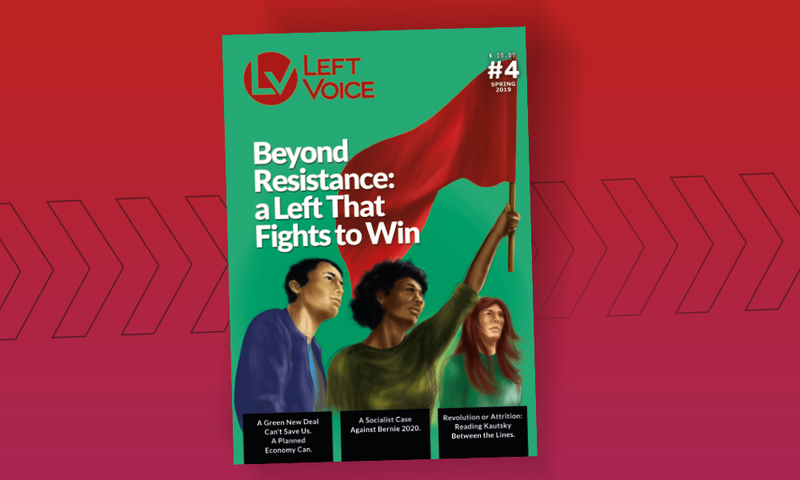 * Internationalen (The Internationale) is the newspaper of the Socialistiska Partiet (Socialist Party), the Swedish section of the Trotskyist United Secretariat of the Fourth International (USFI).